It's that time of year again where hundreds of photographers around the UK end up dazed and confused and a small handful end up quite happy and one quite rich. Yes it's the Take a View competition - the UK's only dedicated landscape photography competition. I have been quite critical of the competition previously and have drawn the occasional ire of a few people but this year I'm going to try to be as positive as possible (however difficult it may or may not be). Well firstly a big 'Well Done!' goes to Anthony Spencer , a very hard working landscape photographer from Dorset who has won the main prize (and a cool £10k) for his picture of Corfe Castle (the image featured at the top of this post). I'm sure Anthony will make very good use of the money and esteem that comes with the prize. Anthony creates a large range of different pictures and despite the winner being very good, I do much prefer his recent lavendar pictures, his wonderful shot of Kimmeridge and a great shot in Sgwd Ddwli. I've only seen the other images from the Sunday Times website (unfortunately protected by Murdoch's wallet) but from the 16 that are on their, I really like four of them, which is about on par with the amount I liked from last years. The other good news so far is no sign of any Crabgate (google it if you want to know) and the preponderance of HDR is reduced somewhat. an their followed quite a few shots at different stages. The winner was one that really showed the colour and amazing height of the cliffs. Rhys is an old 'albmuen' plate photographer and is looking to take up large format again sometime. The next two photographers are both black and white, one of whom is a fellow Yorkshireman. We'll start with Mark Voce, that Yorkshireman from the city of Brighouse. He's a platinum printer and winner of the Prix de la Photographie prize, who uses a combination of Hassleblad medium format cameras with black and white film and a Canon 5dmk2 (plus a Lubitel, Diana and a Zero Image pinhole). His winning photograph in the competition was a photograph of La Vallette bathing pool in Guernsey and although firmly in the Michael Kenna school, it is a beautiful image. 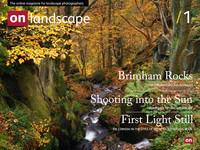 There are another couple of shots I quite like - Jon Brook's shot of the heather burning in Bentham makes a great documentary landscape photo, Paul Sansome takes a good competent shot of La Corbiere lighthouse, Adam Burton (a Take a View regular) includes a shot of the Newlands valley (http://www.adamburtonphotography.com/gallery/view/valley-of-light/) that is well taken but not spectacular, sorry Adam you've taken, and entered better, Jim Parren's shot is an interesting find and great idea, but again I've seen a lot better from Jim too (after chatting, Jim admits it wasn't his strongest and he overgradded because he only had one available at the time). So, some great photography on show and I've managed not to be too critical (although I had to ignore the Parkour shots, the full breakfast in front of an inner city with steamtrain, hobgoblin slumming in london, pipeline installation lot, inner city photographs - which I personally don't find to be landscape - but that's another article).